This purpose designed stylish handbag has two compartments; one for your daily essentials and the other for your allergy medications. 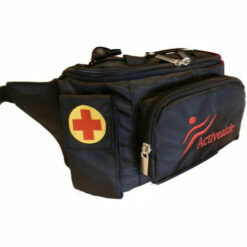 Discounted price for bags with minor cosmetic faults. Scroll to the bottom for full details. 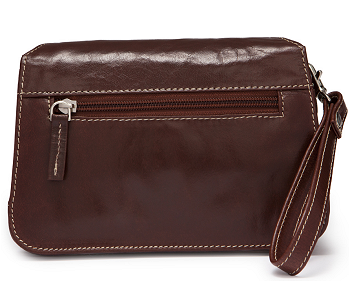 Designed for stylish teens and young adults, this purpose designed leather purse for EPIPEN® auto-injectors has two compartments; one for your daily essentials and the other for your allergy medications. The compartment for daily essentials will fit most phones, money and lipstick. It also has ID, license & credit/gift card slots and an interior zip pocket. 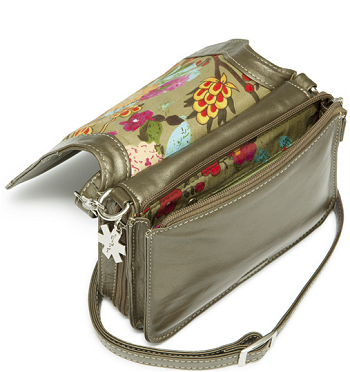 The compartment has a zip and a magnetic flip closure for security. 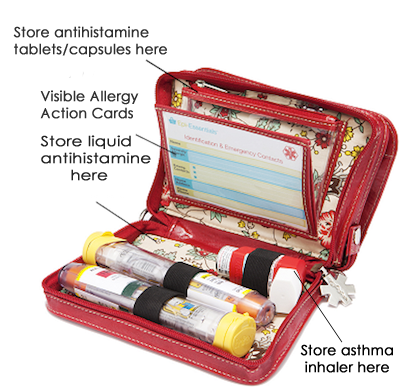 The allergy compartment will fit 2 EpiPen®, Jext® or Auvi-Q® auto-injectors, an inhaler and a small bottle of anti-histamine. It also has a clear flip sleeve for an allergy action plan/emergency contact card (included) and a clear zip pocket for other medications like tablet anti-histamines. The allergy compartment is a zip closure, the zip tag is a medical symbol so that people will know that there are medications stored inside. There is also a small zipped pocket on the back of the bag. The bag is available in four colours: Brown, Olive, Black and Red. The bags have either a double strap or a single strap. 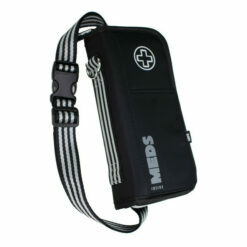 The double strap will fit 2 EpiPen or Jext adrenaline pens but will not fit an Auvi-Q injector. 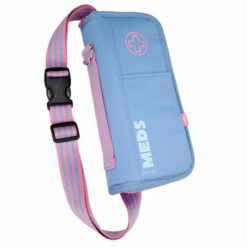 The single strap is will also fit 2 EpiPen and Jext auto-injectors and will fit an Auvi-Q. Some of the red bags do not have a shoulder strap, only a wrist strap for carrying the bag in your hand. There are loops where you can affix a strap of your own to the bag if you wish to carry it on your shoulder. 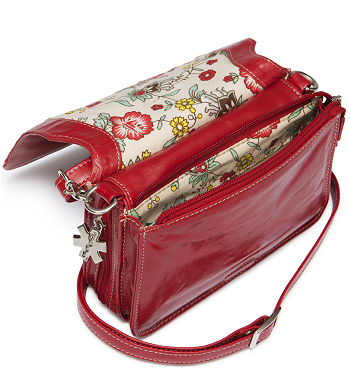 Two zipped compartments: one for allergy medications, the other for daily essentials. 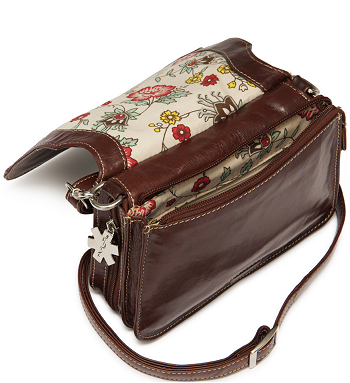 Adjustable cross body strap and wrist strap for easy carrying. 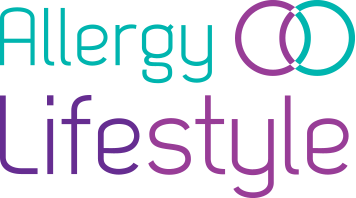 Fits 2 EpiPen®, Jext® or Auvi-Q® adrenaline auto-injectors, an inhaler, and anti-histamines. Space for most phones, money, cards and lipstick. Dimensions: 7.5″W x 5″H x 2 1/2″D (closed). Our Grab and Go EpiPen Handbags are the last of their kind. We bought the stock out from the supplier who no longer makes them. This means that these are the last ones available anywhere! As these are the last of the handbags, there are some that may have a minor cosmetic fault, mostly glue stains on the inner lining or wrinkles in the leather. These faults may make the bag look “less than perfect” but they still function exactly as intended. As these bags have the slight defects, we are selling them at a reduced price. If you want to see the bag before purchase, please contact us and we will send photos of the actual bag you will be buying. That way you can see for yourself the cosmetic fault. 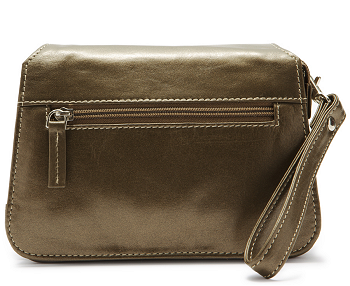 The less than perfect handbags are available in Metallic Olive, Red and Brown. What exactly is a “Less than Perfect”(LTP) Product? Occasionally, we come across products in our inventory that do not meet our standard of quality. Although they function exactly as intended, they have cosmetic imperfections such as inconsistent wrinkles or subtle markings on the leather greater than our intended design. Great product. My 10yr old daughter loves using the new epi pen handbag.